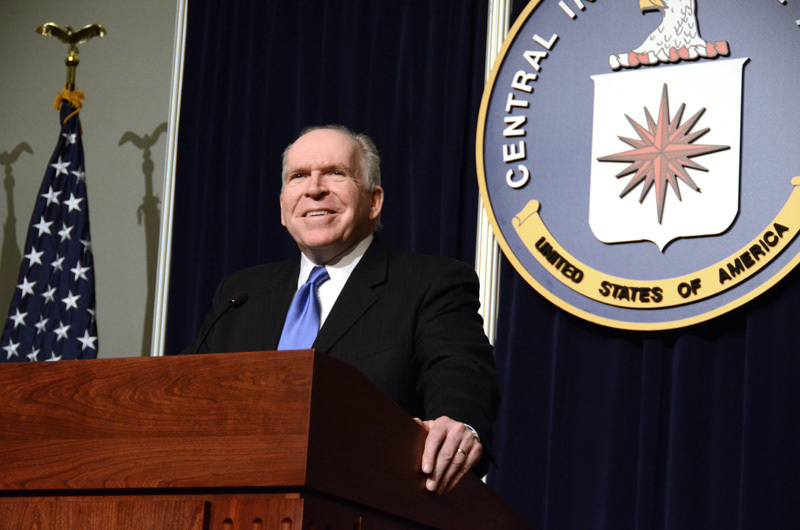 John Brennan brings heavy baggage to his new job as CIA Director – legal as well as moral – arguably making it risky for him to travel to more than 150 countries that are party to the United Nations Convention Against Torture. It must be hard for Brennan to recognize that he cannot land in Europe, for example, without fear of being arrested and arraigned for kidnapping (also known as “extraordinary rendition”) and torture (now antiseptically called “EIT” for “enhanced interrogation techniques,” which, by the way, is a direct translation of verschaerfte Vernehmungright out of the Gestapo handbook). For a freshly confirmed CIA Director it is de rigueur to pay an early call on European counterparts. I remember preparing a briefing book for that purpose just before a new CIA Director named George H. W. Bush took off for the UK, Germany and France in the early spring of 1976. Unfortunately for Brennan, there may be complications to enjoying April in Paris – like a possible knock on the door from a French prosecutor and the gendarmes. 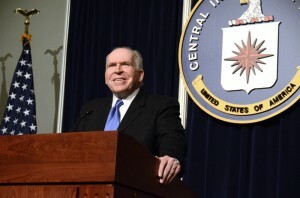 Given Brennan’s role as a senior CIA official during President George W. Bush’s “dark side” days of waterboarding detainees, renditioning suspects to Mideast torture centers and making up intelligence to invade Iraq, Brennan’s advisers are sure to remind him that he may be in as much jeopardy of being arrested as former Defense Secretary Donald Rumsfeld. After leaving the Pentagon in late 2006, Rumsfeld had his own close call with Lady Justice. In October 2007, Rumsfeld was in an auditorium in Paris preparing to deliver a lecture when he learned that the Paris Prosecutor was mulling over what to do after being served a formal complaint against Rumsfeld for ordering and authorizing torture. The charges against Rumsfeld were brought under the 1984 UN Convention Against Torture (CAT), ratified by both the United States and France. The complaint was brought in France under the concept of universal jurisdiction. The criminal complaint stated that because the authorities in the United States and Iraq had failed to launch any independent investigation into the responsibility of Rumsfeld and other high-level U.S. officials for torture – despite a documented paper trail and government memos implicating them in direct as well as command responsibility for torture – it was the legal obligation of states such as France to take up the case. The complaint also noted that the U.S. had refused to join the International Criminal Court, which might have had more routine jurisdiction. In an attempt to avoid a major diplomatic headache, U.S. embassy officers advised: “Run, Rummy, Run,” before the Paris authorities decided what to do. Rumsfeld went out a side door, slipped into the embassy, and then got out of Dodge tout suite. Rumsfeld’s skedaddle from Paris thus spared him the possible humiliation that befell Gen. Augusto Pinochet, who had been head of Chile’s military dictatorship from 1973 to 1990. While on a trip to the United Kingdom in 1998, Pinochet was arrested on a Spanish judicial warrant and was held under house arrest until 2000. The Spanish judge cited the same principle of universal jurisdiction. Pinochet was freed only after the intervention of high-powered friends, including former President George H.W. Bush and former Secretary of State Henry Kissinger. That was only the first of several times when European judges applied that principle, declaring themselves competent to judge crimes committed by former heads of state, despite local amnesty laws. If former heads of state are vulnerable, it seemed to follow that former defense secretaries and other senior subordinates must be as well. If the Rumsfeld precedent were not enough to make Brennan think twice about travel to Europe, he has surely been told of the criminal complaints lodged in Switzerland (also a CAT signatory) against George W. Bush in early 2011. When the former president learned of it, he decided not to take any chances and abruptly nixed longstanding plans to address a Jewish charity dinner in Geneva on Feb. 12, 2011. This drew a sharp rejoinder from Brennan: “Quite frankly I think it’s rather arrogant to think that we are the best in every case in terms of eliciting information from terror suspects.” Right. In the decades since World War II, many “friendly” intelligence services have acquired a lot more experience with verschaerfte Vernehmungthan the CIA, though it often served as the tutor. A comprehensive study just published by the Open Society Justice Initiative reveals that, under President George W. Bush, Brennan and his counter-terrorist team suborned the officials of 54 other countries to cooperate in the rendition program, providing help of various kinds, including transiting their land, airports or airspace, or accepting secret prisons in their countries. It is no secret that the purpose of “rendition” is to move detainees secretly to countries with experience/expertise in “enhanced interrogation techniques” or to the infamous CIA “black sites” abroad where waterboarding and other abuses took place. Such activities violate the Convention Against Torture and, often, national laws. What is new is that some governments in both “old” and “new” Europe – a distinction that Donald Rumsfeld would make derisively against France and other parts of “old” Europe – are now showing a common commitment to justice by prosecuting former heads of their own intelligence services. Italy’s former chief of military intelligence, Nicolo Pollari, just got ten years in prison for helping the CIA abduct Egyptian cleric Osama Hassan Mustafa Nasr (aka Abu Omar) from the streets of Milan in early 2003 and send him to Egypt for more “enhanced” interrogation. More than two dozen Americans have been tried and convicted in absentia for this case of truly extraordinary rendition, in which they exhibited notoriously adolescent tradecraft. If any of them travel to Europe, they risk arrest. John Brennan should remember that highly embarrassing flap quite well, since it came on the eve of his appointment to head a newly created Terrorist Threat Integration Center. And in “new” Europe, in January 2013, Zbigniew Siemiatkowski, former head of Poland’s secret service and former minister of internal affairs, was indicted for his role in cooperating with the CIA renditioners and torturers. Siemiatkowski facilitated CIA renditions and the establishment of a CIA “black prison” in Poland, where the U.S. arranged interrogation and torture of terrorist suspects snatched from their home countries. It is no overstatement that for the first time since World War II, many foreign intelligence chiefs are likely to have very mixed reactions to being seen, even in Washington, with a freshly minted CIA Director with the heavy baggage that Brennan carries. So where might these intelligence counterparts get together without too many risks. What about the Bahamas? It has signed CAT but has not yet ratified it. So, with adequate security forces deployed, there may be a measure of safety there. For the time being at least, Bahamas could offer one of the few feasible ways that Brennan would be able to schmooze with key foreign counterparts – perhaps by offering as a bonus a timeshare week there. A short flight for travelers from Washington, DC, Bahamas would have another cost-saving advantage in saving on jet fuel. Besides worries about arrest, Brennan has other compelling reasons to stay at home for a while. Iran’s nuclear program remains on the front burner as it has since early 2008 when the Director of National Intelligence revealed the National Intelligence Estimate completed in November 2007 concluding, unanimously and “with high confidence,” that Iran had stopped working on nuclear weaponization in 2003 and had not resumed that work – a judgment revalidated every year since by the DNI. That assessment has not prevented neocons and their favorite media personalities from trying to make Iran’s nuclear program seem more menacing. On “Meet the Press” on Feb. 3, for example, Defense Secretary Leon Panetta was the subject of attempted mousetrapping by NBC’s Chuck Todd, who clearly was hoping Panetta could be maneuvered into contradicting the NIE. Never mind Brennan’s disingenuousness in conflating Iran with North Korea. The question is how could he diverge so markedly both from what Panetta said just four days before, as well as from the unanimous assessment of the entire U.S. intelligence community that Iran stopped working on a nuclear weapon in 2003 and has not resumed that work. In no way does that continuing assessment support his claim that Tehran remains “bent on pursuing nuclear weapons” and ICBMs to deliver them. There are, of course, reasonable grounds to suspect that Iran might be seeking a capability that eventually would allow it to rapidly break out of Nonproliferation Treaty (NPT) constraints on building a nuclear weapon. That, of course, is why U.S. intelligence is riveted on monitoring related activity in Iran, as are the UN inspectors in Iran. But “bent on pursuing” ICBMs? Really? Iran has not flight-tested a ballistic missile with ranges in excess of its 2200-kilometer-range Sajjil MRBM. Nor has it launched a space rocket that might conceivably be a suitable model for an ICBM. Has Brennan found someone – perhaps an analyst left over from the notorious 2002 NIE on WMD in Iraq – to tell him the Iranians are testing ICBMs in their hardened underground sites? I doubt that Director of National Intelligence James Clapper, who observed at close hand the concocting of fraudulent “intelligence” on Iraq, will cave in to the likes of Brennan “fixing” the intelligence on Iran. However, there is no word yet this year on when the DNI will present the annual worldwide threat briefing – traditionally given in sworn testimony to Congress in January or February.